Every day, by 8.00 AM, she arrived with her leaf green tote bag, eyes shaded by an oversized pair of sunglasses and feet strapped casually in beige Roman sandals. 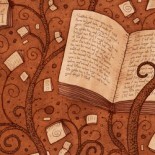 She always had a couple of books in the crook of one arm and chewed gum thoughtfully. Ronnie assumed she was about nineteen, perhaps older. The bleached strands of hair that escaped the rotund bun at the base of her neck reminded him of coir strings. She stood exactly in the same spot, leaning against one of the iron poles supporting the roof of the bus-stop, which was a rectangular structure with an asbestos roof and a naked brick back wall. Usually, Ronnie pretended to study the large posters on that wall (sometimes of upcoming Bengali films and beauty creams, and occasionally of an appeal for a Bandh or workers’ strike by one of the numerous official Labour Unions of Calcutta) after she had arrived, so that she didn’t think he was cheap for staring at her. When she didn’t show up today, Ronnie’s heart skipped a beat. Did she change her route? She always got off at Esplanade, two stops ahead of his. In his head, Ronnie had the whole story worked out. She was probably an MA student who would rather study fashion or she was an artist who had been forced to dive into Economics lessons to appease her business-like parents. He flicked back the white shirt sleeve, always white and starched like a tent, to glance at his new HMT watch. Birthday gift from his father, the first in ten years. Ronnie’s throat was dry. He swallowed and looked up momentarily at the sky. It was summer already and the month of April had missed its first shower of rain. The scheduled bus screeched to a halt as it did daily at 8.15 AM. A couple of men who stood ahead of Ronnie in the cue, boarded it. Ronnie looked over his shoulder to see if the girl was running late. She wasn’t at his heels. Reluctantly, he followed the bored passengers inside. The bus ride was particularly tedious. The road was bumpier and the crowd thicker than usual. Every single bend seemed to twist Ronnie’s body to take the shape of an ungainly angle, as if he were made of river mud; he wanted to jump off the bus, on to the pavement and wait for the girl. By the time Ronnie reached his office in Maniktala, he was irritated; sweat formed damp, circular, orbs, under his armpits. His jaws ached from clenching and his wrists were sore from holding on to the rod overhead. Ronnie strolled into the cramped office space where two other people sat, hammering away at the last of the Imperial typewriters imported from London. Recently, there was an announcement in the papers of the Imperial Typewriter Company’s closure. He had read in a foreign journal that America was going to replace the typewriter with electronic machines that could type and print. In Calcutta, nobody cared. Normally, the staccato rhythm of those keys soothed him, but today Ronnie felt like breaking them with a sledgehammer. The pale walls of the office room, the thirty-year-old ceiling fan, the trek up the narrow stairs flanked by betel juice stained walls, depressed him inordinately. Ronnie froze. What on earth were they talking about? Had they seen him watch that girl in the bus stop? Had they stalked him from his home? He feigned indifference while his heart jumped around in his ribcage like a scalded cat. Ronnie always took great pride in hiding his feelings and maintaining a poker face. With his back turned to the duo, he calmly opened his leather briefcase; an expensive gift from his father when he got this dull job at NMN. His father had, of course, had a hand in getting this job for Ronnie by ingratiating himself to the business owner, a certain rotund man who went by the name, N. M. Narasimhan. Everyone called the business man who owned this poky office, NMN. His tea-garden employees didn’t pass a chance to mock the tongue-twisting initials. Sanjib with the lisp, who ironically dabbled in poetry and speech writing for the CPI (M), the most passionate speech-writing political party of Bengal among other things, had said Narasimhan’s initials sounded like a film production company from Madras. Since Biplab was in his late forties’ and by virtue of sheer experience that comes with trying times and a poor job market in Calcutta, avoided expressing his glee as jovially as Sanjib. Secretly, of course, he enjoyed it all the same. Biplab looked at Ronnie with speculative eyes, who pulled out a file and placed it disinterestedly on the wooden desk. Ronnie took out a new pack of Charminar cigarettes from his briefcase and placed it on Biplab’s table next to the column of typed sheets. He didn’t look at the older man who was now eyeing him with increasing suspicion. It would be fair to say that Ronnie hated Biplab and Sanjib,and their dhoti-clad backsides, but felt it was prudent to tolerate them for their tenure at NMN and also the proximity they had with the business owner. Ronnie opened a file and sat on his chair. The desk was uncluttered and the opposite of Biplab’s and Sanjib’s. He avoided looking at the other desks as he hated disarray. His mind was still on the bus-stop girl, who didn’t show up today. Suddenly, the silence in the room and the absence of the typewriter keys hammering away into his thoughts made him wary. He turned to the men who stared at him, as if he were an alien who had just stepped out of a spaceship. ‘We asked, are you coming? You didn’t reply. Then Biplab Da asked you…,’ Sanjib said. Ronnie glanced at Biplab, then again at Sanjib’s inquisitive face next to Biplab’s. Both looked decidedly sneaky and suspicious by Ronnie’s taciturn silence. It was true that he was neither being polite nor cordial this morning, a pretence he had mastered like a musician playing the same symphony for a decade in the company of this duo. ‘Please take the cigarettes. I bought them for all of us. I will join you for the next break. Just remembered about the report NMN told me to send out last week. I forgot about it.’ Ronnie managed to respond calmly. ‘Okay. We won’t be long.’ Biplab pursed him lips and left with the pack of Charminar. ‘All okay?’ Sanjib asked again, to which Ronnie nodded curtly. As soon as they left him alone, Ronnie could think of nothing else except the girl. Could it be possible that he was in love? The love-at-first-sight kind of thing? He didn’t doubt that it could happen but to others, not to him, given his last experience. He was way too practical for that kind of indulgence again. Besides, he was already twenty-five and that girl must be no more than nineteen? Eighteen? Seventeen? It was hard to tell about girls these days. They dressed like they were older – heels, lipstick, plucked eyebrows…and yet, they always turned out to be younger. Only if he could speak with her once, hear her voice, and gauge the depth of her responses to him, there could be a possibility of guessing her age accurately, and perhaps even getting over this obsession. She seemed so remote and unaffected, so serene and unattainable, conditions and qualities that women sorely lacked these days in Calcutta, that it made her all the more desirable and exclusive. Ronnie sighed and sat back on his chair. He heard the fan turn overhead like the wheel of time, and the clock tick like a bomb. He pushed back the file on the table and looked about him. His heart pounded and his palms sweated. It was a familiar sensation, something he had felt a year ago. But now? He couldn’t understand why he felt so anxious, guilty and distraught for wanting to meet that girl again. She was just a stranger who looked pretty. Ronnie didn’t want to speak about it to these two typists, whom he didn’t trust at all. They could go to NMN and imply something about Ronnie’s character. They wouldn’t force Ronnie to confess about his obsessions or distractions, but these men on the periphery, who had boring jobs and low pay or were unemployed altogether, always talked when they smoked. It was an aberration of nature, according to Ronnie, because most of these types of men he knew, including his father, hardly spoke much at other times, but give them a cigarette in their hand and a tumbler of tea in another, and they started to speak! It was like a truth serum or something, a cathartic cleansing of sorts perhaps, which forced the words to come out definitively like the puffs of smoke. Ronnie trudged along like a tired shopper through the day, trying to negotiate the best deals for NMN over the phone with no help from the typist duo, who took more breaks than before. He was relieved to be spared; neither of them asked him out again for tea. They didn’t return the pack of cigarettes either. Since Ronnie had never worked for a trading company before, the idea of having made an unprofitable deal always stressed him out. Today was one of those days when he wasn’t sure if he had struck the right note with some buyers. The prices of tea were falling, which was always bad for business. A trader was planning to export tea to Sri Lanka and Pakistan. NMN wasn’t keen to entertain them unless Ronnie managed to get the desired price. The thought of speaking with NMN filled Ronnie with loathing. NMN was his father’s ex-colleague from Dunlop, which had shut down some years ago. When NMN heard that his friend’s son was looking for a marketing job, he quickly made an offer. His company traded in different kinds of tea that were bought to Calcutta from Dooars and since it was a deliberately small operation, NMN could afford only a couple of hands in the Sales Office at Calcutta. Ronnie was an important part of the gang, as NMN liked to say, but only because he was the only person with a recognized General Management certificate from a private institute. On several occasions, NMN had placed a call to Ronnie’s father and complained of inane things like Ronnie’s low energy, lack of interest in travel and poor negotiation skills. Unfortunately, Ronnie’s father was terrified, the kind of fear that only penury can bring and that which remains inconsolable, so he came down hard on his soft-spoken son with the power of parent. Later that evening when Ronnie sat in the bus, he pined for the girl again. She was a student no doubt, and like his ex-fiancée, took an interest in nothing, except her own self. It was evident in the way she stood and waited for the bus, as if she didn’t care if it showed up or not. An invisible string attached to the old love – his ex-fiancée – tugged at his heart. Sharmistha had popped up like an unexpected hundred-rupee bill in his life, when he least expected to fall in love. Just like this girl. But now it was nearly a year since that unfortunate incident. Sharmistha’s unforeseen rejection of him on her birthday party, by the poolside in Calcutta Swimming Club, in the presence of fifty odd people was a humungous disaster. Since that day, Ronnie had raised a cold wall of bricks between his heart and his thoughts of her. Ronnie remembered the reason for the rejection very clearly, as if it had played out last week only. Sharmistha’s father, Deb Saha, who was a scion of a leading business family from Calcutta, an exporter of cotton garments to London and other parts of the world, had approved of their engagement earlier. Within a few months of that agreement, when he learned of Ronnie’s father’s misfortune – the older Roy had been laid off and all familial responsibilities now rested with the son – Deb Saha changed his mind. Sharmistha was stumped; soon she recovered from the shock of her father’s decision, took all matters of convincing him again into her own hands and promised Ronnie an easy ride. She only had one condition which Ronnie didn’t comply with and so, theatrically and publicly, out of sheer rage, Sharmistha broke off the engagement and called it quits. Ronnie didn’t miss her or want her back any more than he did before he met her in Presidency College; yet today, the bus-stop girl had brought back the bittersweet pain of a possible love that was lost forever. Would this sweet girl with that green tote bag ever ask him to leave his parents like Sharmistha had? He didn’t think so. The next morning, Ronnie strode briskly. He held his head high. He hadn’t slept all night. When he rose in the morning, the solution presented itself to him like a vision in a dream. He knew what he had to do. Ronnie would speak with the girl. That would put his obsession to rest. It could also perhaps open the door to a new love story, but that was another matter. To Ronnie’s good fortune, there she was already, just before 8.00 AM, standing as erect and unconcerned as the iron pole of the bus-stop. Today she wore a bright red blouse teamed with a blue skirt; a white and pink floral scarf tied back her waist length hair in a most becoming manner and she wore make-up. Her lips were bright red and her cheeks were rouged. Ronnie imagined it was her birthday. The girl looked so fresh and eager without the books in the crook of her arm; her green tote bag was replaced with a sparkling white one. Obviously, new. She glowed under the morning sun like a newly bloomed flower. There was an untouchable quality about her today, which Ronnie believed was called ‘happiness’. The girl pushed up her sunglasses to the top of her head. His rising courage did a somersault and fell back into the pit of his stomach. He wanted to say something quickly, aloud. Ronnie found his tongue figuratively missing from his mouth when she looked at him. Her eyes looked right into his, through him, challenging and curious. For the first time, he saw them; kohl-lined, bright, dark brown, glittering with a hundred interesting questions. She smiled suddenly, unexpectedly, her cheeks dimpled and her mouth twitched. Ronnie sucked in his breath. He gaped, forgetting to breathe or smile or say a word. She blushed a little, her smile deepened like her dimples and then with a hint of a flirtatious shrug, she looked away. Ronnie stood beside her, staring, like the iron pole supporting the roof, unable to move, stuck and totally unattractive. The bus rolled up at 8.15 AM and the girl marched ahead of him; without a backward glance, she got on the bus and took a seat by the window. ‘Are you coming or not?’ The bus conductor yelled out at him from the step. Ronnie didn’t reply, his eyes that followed the girl now rested on her by the window. The conductor rang the bell impatiently and the bus started. The girl looked at Ronnie, completely amused, as it were from her quizzical expression. Then, to Ronnie’s horror, she started to laugh at him, softly at first and then uncontrollably like she would if she watched a circus clown. The bus picked up speed, and just as it passed Ronnie, the girl stuck out her hand impulsively and waved at him. In that moment, Sharmistha’s dazzling smile floated out of a grey cloud from his memory bank, forcing him to acknowledge that he was still in love with his ex-fiancée who had never loved him, because this bus-girl resembled her entirely. She was possibly as rash and impulsive, and amused by his muteness, his organized and boring life, as Sharmistha had been. Ronnie took a deep breath and exhaled slowly. His eyes started to grow moist with tears of realization. He looked around him, embarrassed and helpless. A poor man came by with a gunny sack, and began to scavenge for bits of paper from the pavement. After a moment, he became aware of Ronnie, frozen in his starched white shirt, spotless black paints and polished Bata shoes. Ronnie surfaced from the turmoil in his heart, breathless, but determined. ‘Time to go home,’ he mumbled and turned away from the poor man. He started to walk back in the direction of his residence…faster and faster…the handle of his briefcase cutting into his hand as he gripped it tightly. Everything faded away softly; the traffic sounds, the streets, the people and the present time. A tramcar chugged up behind Ronnie as he strolled on to the tracks. It clanged its metallic bell furiously, and hissed and screeched. Oblivious to the tramcar universe around him, Ronnie walked on and on, not hearing the sounds of approaching Death. He was immersed in the dead calm of a revelation so great that it had finally set him free. Ronniewas willing now to accept, once and for all concerned, that he had been wrong in desiring and pining away for the love of a stranger. Sharmistha had always been a stranger to him, just as this bus-stop girl, and strangers couldn’t ever really love other strangers. 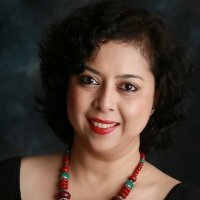 Arpita Bhawal is a writer, blogger and guest columnist based out of India. Her first short story, ‘The Birthday Party’, was published in 2009 as part of an anthology (The Shrinking Woman and Other Stories) by Unison Publishers. While her day job involves writing ‘serious stuff’ in the corporate world, her first love remains fiction. Arpita graduated with Honours in English Literature from St. Xavier’s College, Calcutta. Vices of Eden, her first anthology of short stories was published in 2014. Good story line, as usual. The era is well described and felt nostalgic about those simple days. This entry was posted on June 26, 2016 by artikabakshi in Fiction, Indian, short stories, Short Stories and tagged Arpita Bhawal, Vices of Eden.